Those citizens are in addition to the people who were removed from the list earlier this week after the secretary of state's office found they had been added by mistake. In a mass email sent to local election officials Friday, the secretary of state’s director of elections, Keith Ingram, offered additional guidance to counties looking to clear voters from their lists without sending notices demanding proof of citizenship. Among the advice he offered to those election officials “after speaking to a number of counties” was to review registration application files collected at ceremonies in which immigrants become citizens. Spurred by the announcement, top Republicans — including President Donald Trump — publicly condemned the “illegal voter registration” in Texas and raised claims of voter fraud even before the data was sent to counties for review. But some county election officials said they knew almost immediately the reported total likely included naturalized citizens. Driver’s licenses don’t have to be renewed for several years. 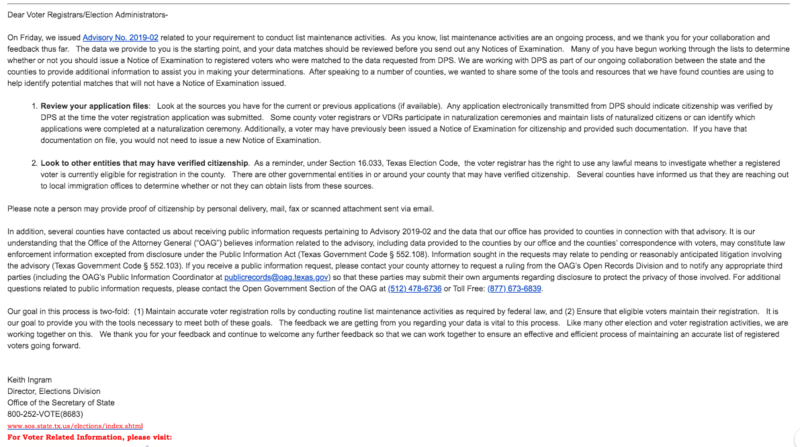 In between renewals, Texans aren’t required to notify DPS about changes in citizenship status. That means many of the people on the list could have become citizens and registered to vote without DPS knowing. Flaws in the data first emerged Tuesday when the secretary of state’s office began calling local election officials to inform them that it had mistakenly included more than 20,000 voters who should never have been questioned because they had verified their citizenship when registering to vote at Department of Public Safety offices. Left unanswered was whether those remaining on the list included naturalized citizens who had not registered to vote in that way. 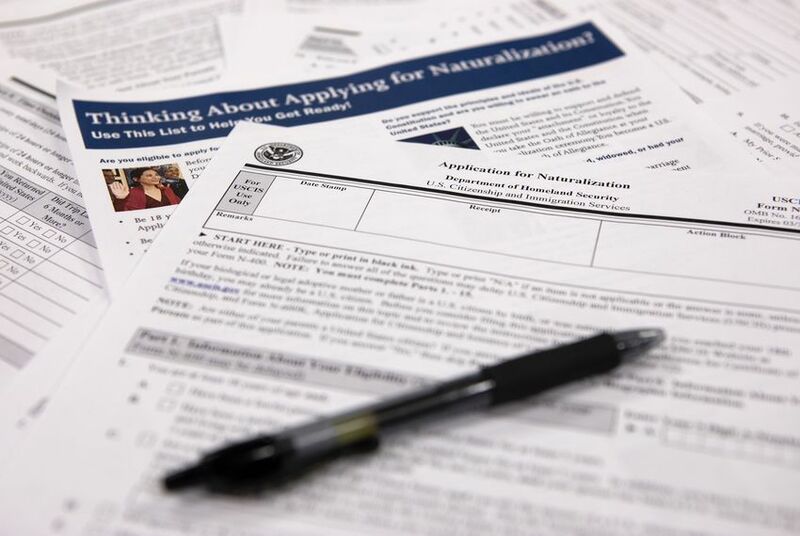 State officials confirmed to some local officials Tuesday that the records they provided might include voters who were not citizens when they applied for driver’s licenses but have since become naturalized citizens. Several officials said they asked the state to provide additional guidance in writing. But the secretary of state’s office has not confirmed that publicly. In a statement Friday, spokesman Sam Taylor said the purpose of Friday's advisory was to "provide additional guidance to Texas counties in conducting their list maintenance activities — specifically, that they may have access to information in determining a registered voter’s eligibility that we do not maintain at the state level." The additional guidance to counties comes as civil rights groups and Democratic lawmakers continue to call on the state to rescind its original advisory to local election officials regarding the voters flagged for citizenship checks, pointing to the errors already discovered in the state's data. While officials in most of the state’s biggest counties have said they’re cautiously deliberating how to proceed, some voters have already received notices to prove their citizenship within 30 days to avoid losing their registration. Galveston County Tax Assessor-Collector Cheryl Johnson, who oversees the voter rolls, began sending out notices Monday. She had to follow up on many of them because they were sent out to U.S. citizens the state mistakenly flagged. Meanwhile, election officials in Williamson County said Wednesday that their original list of 2,033 names had been cut in half after they removed the voters incorrectly flagged by the state and individuals they had been able to identify as naturalized citizens.